Bloodbraid Elf and Jace, the Mind Sculptor have been unbanned in Modern for a week now. Contrary to what we’ve heard since the announcement, the format is just fine, and perhaps even better: it’s fresher, to be sure, with new decks popping up abusing Modern’s newcomers and benefiting from the metagame warp. One development I have found especially interesting this week relates to the gains and losses made by other such role players in the format. Today, we’ll focus on five cards in particular I think stand to benefit from the unbans. This week’s Modern Top 5 is a little different from previous episodes, as it deals less with Modern constants and more with of-the-moment happenings. In the spirit of breaking tradition, we’ll start with our number one winner and work backwards from there. We have to start with Lightning Bolt because of how format-warping the card is. Bolt’s strength in Modern directly affects the playability of its creatures, as well as the cards players must turn to if they aim to interact with opponents. Bolt will always be a Modern staple thanks to its raw power, but the card’s also on an upswing for a variety of reasons. No matter the matchup, Lightning Bolt does something—heck, its floor is a strictly-better Lava Spike, one of Burn’s most prized spells. When it comes to cutting down opposing life totals, three seems to be a number that means something significant; Delver of Secrets and Wild Nacatl are infamous for their unprecedented ability to clock, and Shock has never impressed anyone enough to splash for in any format in Magic‘s long history. Bolt’s sustained relevance across different matchups is a major factor causing players to prefer it over Fatal Push as a removal option. Nobody wants to stare down World Breaker or Secure the Wastes with a Terminate in hand (incidentally, we’re likely to see more Tron-style decks crop up in the short-term to quell the tide of interactive ones). But a way to close out the game? Yes, please! Fatal Push removes creatures. Dreadbore destroys creatures and planeswalkers. But Lightning Bolt kills creatures, planeswalkers, and players! With Jace, the Mind Sculptor showing up in all kinds of decks, having a flexible planeswalker-removing option handy is the dream for most interactive decks. Add to the fact that most interactive decks right now are playing either Snapcaster Mage or Bloodbraid Elf, and Bolt gets even more attractive, as it pairs fabulously with both creatures—and the pair respectively incentivize casting planeswalkers Jace, the Mind Sculptor and Liliana of the Veil. Relevance and planeswalker removal are draws to Bolt that contribute to its overall flexibility. The reason I’m singling out the card’s wide applications is that interactive decks tend to favor cards with immense utility over all others, and Bolt is the obvious poster-child for utility in Modern. Despite its simple text, the card plays so many roles that it’s difficult to overlook for interactive decks, which seek to maximize the work each of their cards put in during a tournament. Indeed, even before the unban, interactive strategies were experiencing something of a renaissance in Modern: Death’s Shadow was stratifying; Logic Knot carved out a niche in Tier 1; Mardu reared its head for the first time ever. Common among most of these decks was Lightning Bolt. I don’t buy the arguments for Jace or Bloodbraid homogenizing midrange. If aggro-control does become more homogenized, it will be to play Lightning Bolt. Bolt’s “second life” as the far-and-away greatest thing to do for one mana in Modern will surely have far-reaching effects on the format, as we’ll see with the next four picks for biggest post-unban winners. 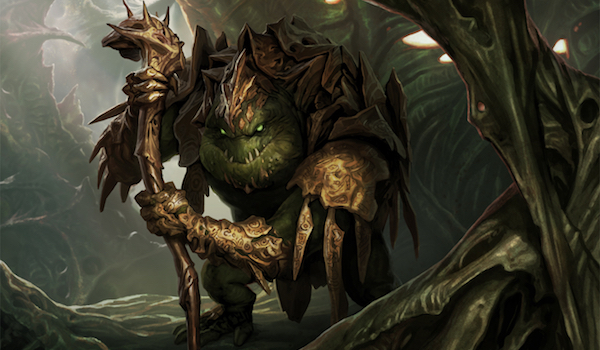 As a creature that merely attacks and blocks, Tarmogoyf is one of Magic‘s most conservative tournament staples in recent memory. How fitting, then, that his comeback coincide with that of the game’s simplest and most iconic spell. I bookended my long love affair with Goyf on this site with an article published last year about casting Goyf in a Fatal Push world. His reign as the greatest creature this side of the banlist, as I saw it, was over; while still an efficient creature with homes guaranteed in green midrange shells, Goyf could no longer be splashed willy-nilly into everything. Modern finally had a clean answer to the infamous beater. The days of Goyf-splashing may be behind us for another reason, though: as more cards enter Modern, the format becomes increasingly streamlined. I don’t mean it’s got fewer decks; somehow, Wizards has managed to keep it incredibly diverse. Rather, the decks themselves boast enough on-theme tools these days to not want a Plan B at all, let alone one that’s lost so much value thanks to Fatal Push. That said, as interactive decks turn to Lightning Bolt as a primary removal option, Tarmogoyf‘s value shoots back up. Despite its fantastic applications in the mirror, I’m seeing Fatal Push be shaved unceremoniously from most Jund decks, with even Jund master Reid Duke opting for only a single copy in the sideboard. Outside of Shadow, which has precarious access to red mana, the decks that can run Bolt once again want it over anything else, opening a window for Goyf to barrel through. Oh, and did I mention Goyf’s an excellent cascade hit? Eldrazi tends to have the upper hand against three-color midrange decks. Its creatures are bigger, it’s got easy access to disruption like Relic of Progenitus and Rest in Peace, and Eldrazi Temple makes the archetype faster than anything Thoughtseize-fueled can muster (outside of, again, Death’s Shadow—apparently the great anomaly of midrange decks). Thought-Knot Seer benefits from Bolts becoming Pushes just as Goyf does. But the tribe’s biggest winner is Reality Smasher. Haste is a broken mechanic, and easily the best of the evergreen keywords. The immediate downside of creatures relative to instants and sorceries is that players need to wait a turn before using them proactively: sure, they’ll block, but that won’t actually win the game. In this sense, haste functions as Time Walk a lot of the time, and is degenerate on an already pushed creature. Consider the effects of Goblin Guide and Bloodbraid Elf on a format, or how the strength of Goryo’s Vengeance and Through the Breach relies on their haste-granting line of text. Reality Smasher is one such pushed creature, and critically is un-Push-able: while four mana used to ensure a creature’s robustness thanks to the prevalence of Abrupt Decay, Fatal Push spares no creature costing less than five. Additionally, flexible removal spells like Dreadbore and Maelstrom Pulse are increasing in popularity to deal with Jace, the Mind Sculptor and other planeswalkers; these sorcery-speed options cannot remove Reality Smasher before it makes a huge attack. Bringing everything home, Smasher itself is one of these “flexible removal spells:” trample lets it run through creatures and crunch into its target, which could very well be a Jace, the Mind Sculptor. Even ticking the planeswalker up upon resolution won’t save it from the colorless behemoth. On a related note, interactive decks these days tend to strive for a late-game; it’s hard to out-grind an active Tireless Tracker, or Command-looped Bloodbraid Elves. Smasher offers an appealing alternative: just kill your opponent faster. We’ve seen Eldrazi Tron hemorrhage shares in the last few weeks, losing out to Mono-Green Tron and most recently GR Eldrazi (a deck already incorporating Bloodbraid Elf with some success). But between this new GR build and other options, there’s certainly no shortage of shells for Reality Smasher right now, and very few decks can kill it reliably. Like Lightning Bolt, Kolaghan’s Command is a highly flexible utility spell. It’s also got a damage-based removal mode that plays double-duty in two matchup Bolt partly owes its comeback mode: Affinity, where it removes Cranial Plating, and Humans, where it shatters Aether Vial. Three may be the magic number for racing, but many Modern creatures that die to Bolt also die to Command. 2 damage also destroys a ticked-down Jace or Liliana. It’s no secret that Command is an insane cascade hit; with Bloodbraid Elf in the picture, Command’s role in Jund shifts from role-player to power-play. Its nastiest mode in this deck is return-a-creature, which recycles Elf itself to yield an aggressive card advantage engine. While it’s a known quantity by now, Snapcaster Mage has a similar effect for blue midrange decks. Despite I’ve seen Traverse Shadow lists pop up recently packing a 4 Elf, 4 Command suite, and Corey Burkhart—who finished 13th at Pro Tour Rivals of Ixalan with a 4-Command version of Grixis Control—even advocates for the entire set alongside Jace, the Mind Sculptor. Command’s combined first mode improving with a widened card pool, the relevance of its damage-based effects with more planeswalkers on the horizon, and the card’s natural inclusion in decks on the upswing ensure we’ll be seeing plenty of this three-drop in the near future. 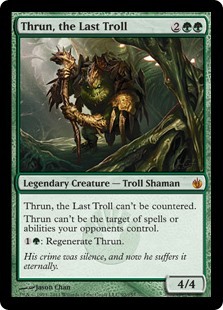 If interactive decks struggle to remove Reality Smasher, they’ll hate dealing with Thrun, the Last Troll! We haven’t seen this card out in full force since the Splinter Twin days, where it single-handedly won the tempo games (some were of course still lost to the combo after Thrun ate all the BGx player’s mana). Modern’s a different beast now, but with the meta shifting towards permission and removal, Thrun smells like an awesome sideboard option. It can’t be touched by self-protecting planeswalkers like Gideon of the Trials or Jace, either. Only Liliana of the Veil removes it, and she does so conditionally; either way, Thrun is a major headache for BGx. A deck that’s secretly helped Thrun get to its current stage of viability is Death’s Shadow. Specifically, the omnipresence of Stubborn Denial is reason enough for UWx decks to pack Supreme Verdict over Wrath of God without thinking twice, and I doubt a mild Thrun resurgence changes that, boding well for the Troll. That said, Damnation still eliminates him, so Thrun-slammers will need to keep Grixis and other black-based control decks on their radar. Part of the fun in a format as dynamic and, well, supported as Modern is that old favorites are often bound to spring back up eventually. Listed here are just a few of the “old dogs” poised for a comeback in the wake of the recent unban. What’s your Top 5? Let me know in the comments! Thrun is bad vs tasigur angler smasher shadow goyf due to his 4/4 statline. Its possible being good vs jace and bolt and I guess bbe moves things back in his favour but thats really the hill he has to climb. Uncounterable is meh when youve got cavern of souls in the format anyways – its not like anyone can afford counting on counterspells to stop creatures. Hes also a green four mana body which is space that some decks will be using for bbe or jace straight up. I agree that Thrun isn’t great. 99% of my experience is with UW control, so he may be better in some other matchups, but on paper he’s at his best against me and he’s still underwhelming. Most control decks are on at least 1 Wrath because of Meddling Mage, a lot also run blessed alliance, and in the late game (which we’re in because Thrun is basically a 6 drop) it’s easy to chain Cryptics to tap, survive for a long time with Gideon Jura, block with Wall of Omens (especially if you have Jace Architect of Thought), gain life with Rev, and just generally not care about an overcosted 4 power beater. All good points! The Modern where Goyf and Bolt are good is the one I want to play in, for sure (whether or not I actually play those cards anymore).